This bloodtrail is 100% real. 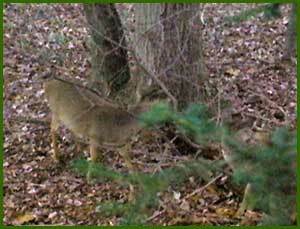 All the pictures and steps are as it happened during a Connecticut Deer in November, 2003. Good Luck! Two young does appear at my treestand. Legal shooting light is fast approaching and I draw my bow waiting for the right shot. I am shooting a 50lb recurve with carbon arrows and a 3-blade cut on contact head. Neither Doe presents a proper angle at first but then it starts to get better as they move toward me slightly. Please evaluate this shot and answer the question below. Does this angle present a good shot?